At a time when everything is a source of a division—when even professional sports have become political lightning rods—how can the Christian church be different? How can we model something radically uniting and inviting to a world going deaf from the cacophony of partisan bickering? Maybe the answer is closer than we think. Perhaps it’s as simple as recognizing the power of something we do week after week, and committing ourselves to it anew: singing together. Amid the discordant chorus of voices in our fragmented culture, shouting to be heard and yelling at one another on social media, the church’s voice can sound altogether different: not shouting at one another, but singing to our Savior; not discordant, but with one voice; not for our own grandstanding, but for God’s glory. The group, which recorded a live album of 13 new hymns during the three-day gathering, represented a wide denominational range—from the Vineyard to Anglican to African Methodist Episcopal and more—and included both musicians as well as pastors, writers, and scholars. Among the musicians in attendance were Josh Garrels, Audrey Assad, Liz Vice, Will Reagan (United Pursuit), Stuart Townend (writer of “In Christ Alone” and “How Deep the Father’s Love for Us”), and Urban Doxology, a ministry committed to “any liturgy, preaching, or music and arts that crosses boundaries in ethnicity, race, and class that prepares God’s people for the city of God.” These artists joined people like Andy Crouch (senior strategist for communication at the John Templeton Foundation), Christina Edmondson (dean of intercultural student development at Calvin College), and others to dialogue about church, worship, and vocation, as well as to record the live album The Porter’s Gate Volume 1: Work Songs, released October 6. The name Porter’s Gate, Wardell said, was inspired by the role of the porter in Christian Benedictine monasteries. Wardell was inspired by the monastic notion of the Christian church as a distinct, set-apart community, not defined by escape as much as “missionary hospitality.” In this vision the porter’s gate represents the church at the point where it intersects with the outside culture. And worship music, Wardell believes, is often the bridge. Wardell serves as worship arts director at Trinity Presbyterian Church in Charlottesville, Virginia, a city that became a symbol of America’s combustible divisions this past August. 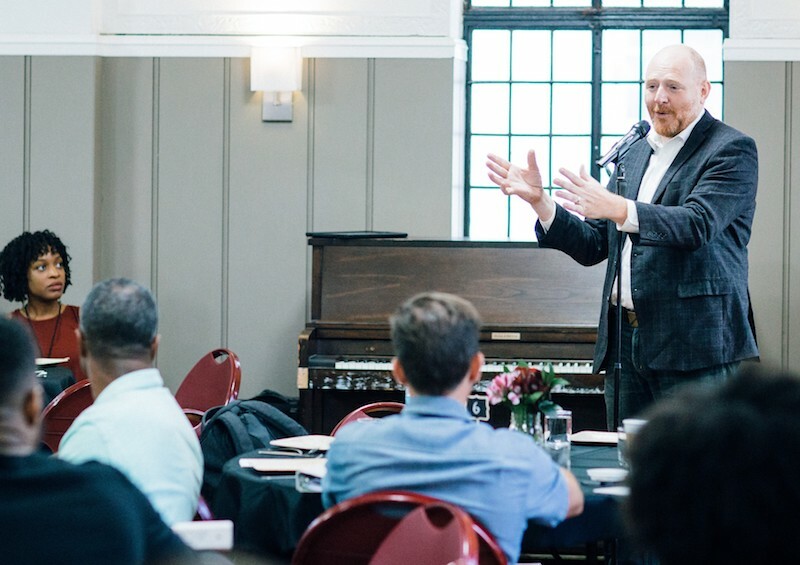 As part of his passion for the church to model unity through worship, Wardell worked alongside other local worship leaders to launch the “Charlottesville Worship Collective” a few years ago, where worship leaders from a broad array of local churches gather regularly to provide support, encouragement, and resources to one another. 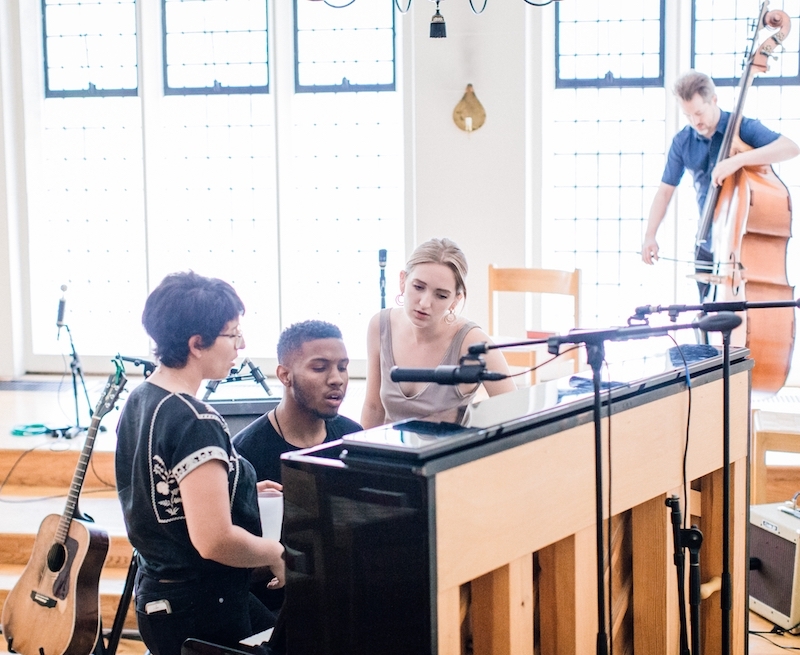 At a time when even the Christian church is plagued by disunity within, Wardell believes music is a “universal language” that can help foster unity. 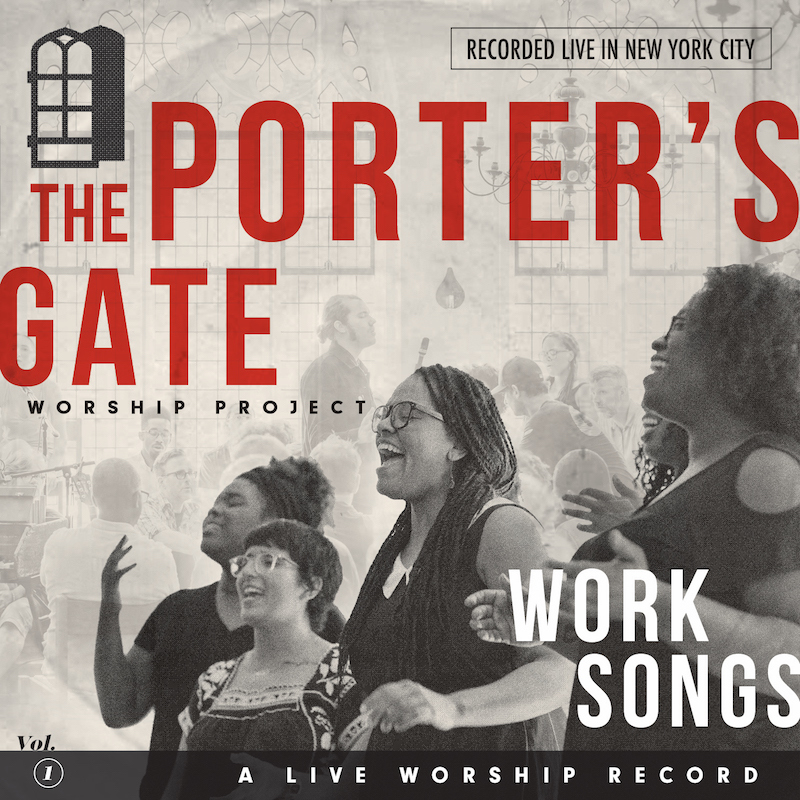 “Music has this amazing harmonious effect, where it’s possible to have a 60-year-old white lady play organ and a young African-American woman sing at the same time, and a Chinese college student can play violin, and they’re all doing it together, and it keeps getting better the more who join in,” said Wardell, who launched Porter’s Gate as a way to practice this thesis. The Porter’s Gate project, which included a few Roman Catholic participants, explored themes pertinent to the broader Christian tradition without necessarily requiring agreement on core theological doctrines. Thomas Terry understands the missionary hospitality of music. In each of these roles, Terry sees the power of music and creativity—what he calls “the language of the culture”—as a sort of missionary bridge between believers in the church and seekers outside. Through Beautiful Eulogy, which releases its latest album, Worthy, on October 20, Terry hopes to create excellent art that packages robust theological truths in a way that is beautiful and compelling, connecting with people intellectually but also emotionally. This vision informs the work of Humble Beast, including this summer’s Canvas arts and theology conference in Portland, co-sponsored with Western Seminary. The conference featured pastors (including John Onwuchekwa, Erik Thoennes, and D. A. Horton), writers (including Karen Swallow Prior, Alissa Wilkinson, Mike Cosper) and musicians (including Propaganda, Jackie Hill Perry, and Liz Vice, who is also part of the Porter’s Gate Worship Project). Noticeably diverse both in its lineup of speakers and also the makeup of the 800 in attendance, Canvas is perhaps proof of Terry’s conviction about the boundary-crossing power of art. Held August 11 to 12, the conference offered a powerful contrast to the disunity happening simultaneously across the country in Charlottesville, where a white supremacist rally spawned protests and then deadly violence. The juxtaposition, Terry said, shows the powerful witness possible when the diverse church of Jesus Christ unites in worship. In a post-Christian, secularizing context, the idea of corporate worship singing is weird, to say the least. 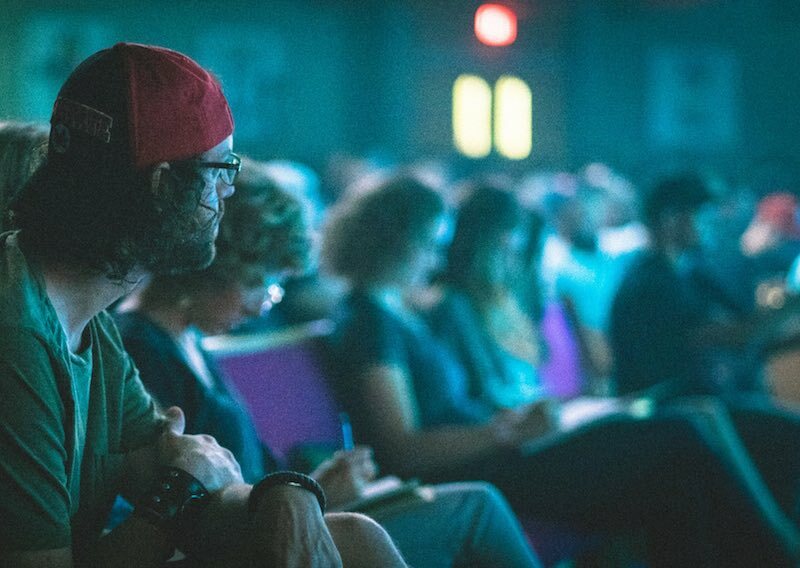 More and more unchurched people have little context for hundreds—often thousands—of people singing out loud together in church; or folk artists collaborating with gospel singers on worship songs in a New York City church; or 800 artists and hip-hop fans singing together in Portland: Hallelu, hallelujah, Father, let Your kingdom come. Singing in worship is countercultural, but that’s precisely why it’s important. In a fragmented and weary culture, exhausted by shrill division, the church has an opportunity to model something better, something rare, strange, and wonderful: People who are different from each other, joining together to sing, in unison, in praise of the living God. Keith Getty, who along with his wife, Kristyn, are perhaps the world’s best-known contemporary hymn writers (“In Christ Alone,” “The Power of the Cross,” “Speak, O Lord”), believes the church is missing an “extraordinary opportunity” if it downplays the role of congregational singing. “We live in a culture where marriages and families are breaking down, where people can barely be civil to their neighbors. Into this culture walks Christianity, where people from every background get together and sing to one another about the Creator of the universe, the One who has redeemed them, the One who is their hope,” he said. When we sing, it is a battle cry of hope for the wounded, for the weary, for the lost. . . . When we sing, we witness to the people in our church who are yet to believe—to the unsaved spouse, the cynical teen, the intrigued friend. We witness to the outsider stepping through the door of a church and even, through the sound we make, to the outsider walking past the door of a church. The sight and sound of a congregation singing praise to God together is a radical witness in a culture that rejects God and embraces individualism. Our songs are the public manifesto of what we believe. The Sing! book, and corresponding conference, are part of the Gettys’ effort—on the 500th anniversary of the Protestant Reformation—to help pastors, musicians, and leaders encourage congregational singing. Just as Luther recognized the importance of music and the radical witness of congregational singing in the 16th century, so should the church in the 21st. It may be countercultural and at times uncomfortable, but singing in worship is essential to the church’s identity and mission. “Singing can never save anyone, but it certainly draws people in a unique way to the One who can,” Getty said.